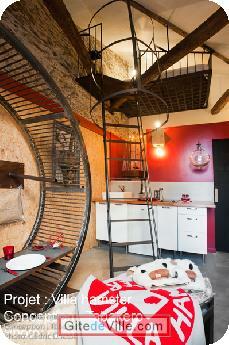 Self Catering Vacation Rental of 18 m² in Nantes for 2 peoples. Live a unique(only) experience(experiment) to the world in THE VILLA HAMSTER. Comfortable and quilted universe in which you will live a new adventure. Is it possible to put me in the place(square) of my Hamster? Make you thighs of Hamster by cavorting in the BIG WHEEL which is then transformed into a comfortable sofa or into a table to have lunch. Sleep in a CAGE(GOAL) perched in the airs(sights) to cross(spend) affectionate nights. Educate by reading you the works on the life of the small rodent. 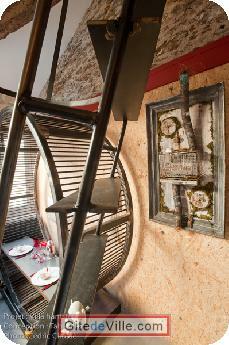 Inventor in 2 006 of the concept of " thematic urban holiday cottage(shelter) ", A CORNER(PLACE) AT HOME is, 3 years after his launch, the 1st operator of accommodation(hosting) with theme in the West of France today. Greeted by the press decoration and the economic press as an actor precursor in the sector of the moved urban holiday cottage(shelter), A CORNER(PLACE) AT HOME is approved by a large majority by the biggest French tourist guides today. THE GREEN GUIDE MICHELIN, GUIDE OF the BACKPACKER, BRIDEGROOM'S(MARIA) GUIDES DOMINIQUE PERRIN and many others else advise(recommend) A CORNER(PLACE) today AT HOME. A CORNER(PLACE) AT HOME proposes 2 types(chaps) of accommodation(hosting): the top of the range with the " range Privilege " and the means of range with " themes ". 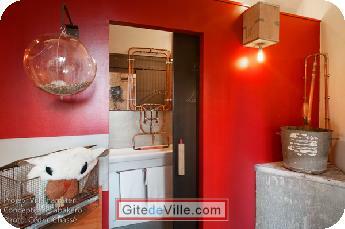 Right in the heart of the historic district of Nantes. The castle and the cathedral are in 3 mn in feet. SITUATED in the pedestrian district of the BOUFFAY, all the transport (bus, streetcar, busway) are in some minutes in feet. Last Ads update : 08/05/2011.